A crease-proof eyeshadow primer that's formulated with coconut extracts to lock in color for up to 12 hours. Lock in eyeshadow looks for 12 crease-proof hours with this luxurious eyeshadow primer that's infused with nourishing coconut extracts. 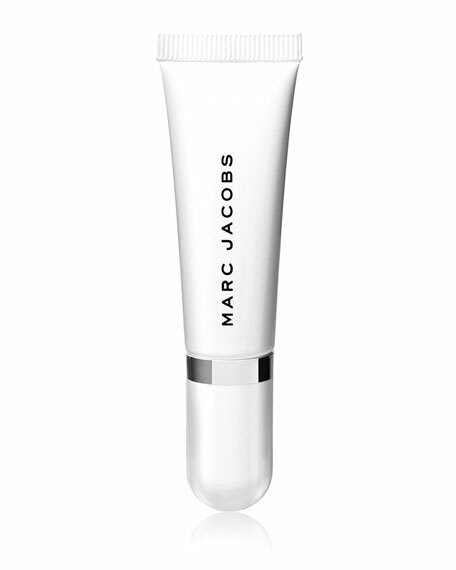 Inspired by Marc Jacobs's love of coconut water, Under(cover) Perfecting Coconut Eye Primer is formulated with coconut and velvet flower extracts to deliver a smooth, even canvas for makeup application. It glides on effortlessly with a creamy, lightweight texture, and helps even skin tone, intensifying eyeshadow for gorgeous payoff in every stroke. Silica spheres and bark extract help absorb oil to fight creasing, for a perfecting effect that feels cushiony and comfortable, and an innovative gel polymer with lilac stem cell helps looks last all day. This smoothing, nourishing eye primer feels like skincare, but delivers on wear, maximizing your makeup. Inspired by Marc's love of coconut water, this coconut eye primer is the perfect companion to Under(cover) Perfecting Coconut Face Primer, as well as Eye-Conic Multi-Finish Eye Palette.